Good news for northern design enthusiasts! Papillon Press is offering an exciting opportunity for three participants to learn the age-old craft of letterpress printing. Our CP & Co New Style Press, inked up in black. 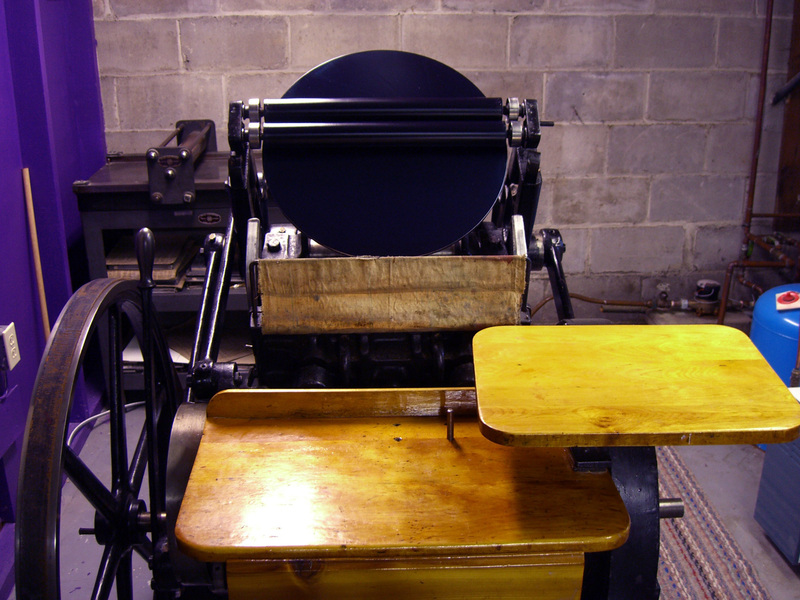 In this day-long introductory workshop, you will be introduced to our vintage Chandler Price & Co. New Style press, learn the basics of setting lead type in the chase, mounting the chase on the press, inking and printing one colour. We will be printing personalized note cards, and we have over 100 type styles and sizes to choose from, as well as boxfuls of ornaments and etched graphics. You will also learn what real “em” and “en” quads are, learn the basic California job case and what all those strange typography terms really mean! We can only take on three participants to ensure everyone has enough time with the press, so sign up soon! Location: our studio at 1287 Cawthorpe Street, Sudbury, ON. 705-618-1168. Registration requires a 50% non-refundable deposit to secure your place, with the balance due upon arrival. Pay by cash, Paypal or cheque. Please contact Chantal at contact@papillonletterpress.com to register.